The safest way to travel is to travel by flights. The best way to commute around the world is via first class flights. There is no doubt or contemplation about that. Unfortunately first class tickets are way too expensive and cannot be afforded for every journey you are bound to take as a businessman. And hence, most people prefer to travel via economy class. However, most travelers find economy class to be too uncomfortable and tedious for travelling, especially when it comes to long flights. And ever since globalization became a reality, business firms have been looking forward to expand aggressively. And in this modern world, a businessman leads a hectic life travelling around the world on business ventures. It is very important for such people who are also frequent flyers to travel with at most comfort and luxury so that their business prospects or the purpose of the trip would not be hampered. Such a journey at minimum cost is available only via business class travel agent. A separate area for boarding and separate entrance to the lounge. You are bound to get exclusive and exquisite meals, drinks, snacks and many more. You have on board free internet access provided by certain airline service providers. Every seat has individual power outlets which helps you to charge your electronic and electrical gadgets during the journey. Special features includes a kit that contains toiletry items, eye masks for sleeping without disturbance, extra pillows and blankets for comfort etc. Business class travel is also known as Executive class travel as they are specifically designed for business executives who are frequent flyers travelling around the world every now and then on business ventures. There is only one word in the English dictionary that could describe business class seat and that is luxury. These seats are highly comfortable and luxurious for one’s journey. These seats can convert into a flat bed. You can sleep without disturbance throughout the journey. There is a touch screen controller associated with every seat that gives you the flexibility to adjust the seat as per your convenience and preferences. The seat also has personal storage area for keeping your hand luggage items, in-seat massage functionality, privacy divider to give each and every passenger their privacy, power supply units built in with seats for laptops, USB ports, large table for providing a comfortable work space, individual LED screen supporting over 1200 channels and radio stations for your entertainment. The services also include magazines for your entertainment. The rest rooms are also maintained pretty well for your hygienic concerns. Last, but not least, every flight attendant provides great care for every passenger. They take responsibility for ensuring you a luxurious journey. 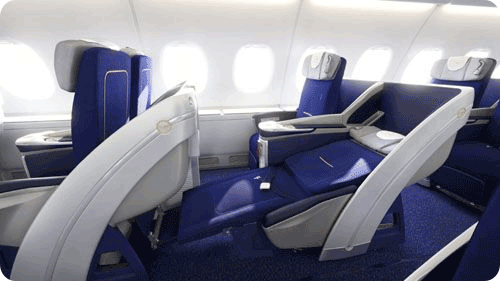 Always Travel via business class travel and for cheap business class tickets, log onto.